We're back and we can hear you loud and clear. We've had a great first round up here at Mactweets, and we've got tweets from many macpassionate folk whose feet are itching to go for another 'happy feet' dance. Jamie and Deeba are loving the response as much as you, and are now thrilled to announce the second challenge. Something about your macs should be NEW. DO SOMETHING OR ADD SOMETHING YOU'VE NEVER DONE BEFORE BUT HAVE ALWAYS WANTED TO TRY! "Maybe drying out fruit to create a flavor/color powder, try Italian meringue, try new flavor combos, try getting feet if you've never done that before... or use your macs to create a new dessert. Out with the old, in with the new!" Because of the holidays, we're giving you a little extra time to post. Please have your Mac Attack Post up between January 10 and January 15 '10. 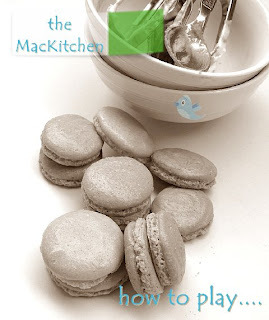 Once you have posted your Mac Attack macarons on your blog, please make sure you leave a comment with a link here on this post. Please feel free to use the Mac Attack logo. It isn't mandatory but is a nice way to get the word out! Add the Mac Attack badge (logo) with link to your sidebar. Round up will be on January 20, 2010. Again, if we have as many or more than this last challenge, we will divide the round up into groups to make sure everyone's macs are visible and you have the time to visit all of them. And attention please!!! add Mactweets to your RSS feed or sign up for e-mail alerts. This way you will always be in the loop and know as soon as we add a new post, a tutorial or a round up. And, as always, spread the word! My new year's resolution....find my feet. My macaron feet! So, I will be joining this challenge! I have only really made the most basic of macarons before so my challenge will to be branch out a little. I am thinking of trying to use pistachios instead of almonds. YAY girls...love your enthusiasm!! have a great new year!! Happy New Year and best wishes to all of you and look forward to "MacAttack 3". The rules sound very tempting! Wow guys! Posts already up? I am impressed! You guys must be sticking to your resolutions! Look forward to the next challenge. Oh right...great stuff going guys! Woot...I'd better post ASAP too!! Thanks for hosting this. Always happy for an excuse to practice these little devils. @57Varieties and @Ben the Baker - Welcome aboard! Thrilled you joined us! I'll be checking everyone's macs tomorrow since husband leaves for 3 days! I'll have the time to savor everyone's macs and maybe even make my own after my huge flop! My post is up. I hang my head in Macaron shame once more. OH FUN...love the way the entries are rolling in!! If you've ever had a disaster with macarons (and who hasn't? ), have no fear, you'll never have to bin them. At least some. Love the sound of it Faithy..Happy 101 Award! What could be better? Huge gracias from Jamie & me for the it. We love it!! I had so much fun doing this challenge, thanks everyone! Hi J&D made them and got them correct by the fourth time that too with Deeba's recipe. I LOVE macarons! I am so happy to have found this site and all of the other participants to learn from. Hope I get posted - thank you!! I would love to be added to the blog roll! Thanks for the offer! I'm up! Chocolate Pistachio Macarons and I never thought I'd make it! Whew! And am THRILLED to see so many peeps here mac-ing with us! may I introduce you to my humble macs? Finally got my Ginger Grapefruit (yes, I said Grapefruit!) macs posted! I'm tardy...it's OK if I'm sent to the corner...with a plate of macarons please? GORGEOUS... all of you macpassionate folk, just too gorgeous! Thank you for keeping them coming in! I have been trying to master them for years! I have almost succeeded so I will try again. Hmm, you’re making me long for a vegan french bistro! I’ve never had such a meal, but it certainly sounds like a treat.